One of the highest (m 3146) and loftiest peaks of the Dolomites (in German: Höhe Gaisl; in Ladinian from Marebbe: Crep Checio); also named Croda Rossa d'Ampezzo, to distinguish it from the Croda Rossa di Sesto (Sextener Rotwand, m 2965) in the Popera Group. Climbed for the first time in 1870 by Whitewell with the guides Siorpaes and Laneuer through the West couloir, after an attempt by Grohmann from the North-West, in 1865, missed by a whisker. Baron von Wulfen's claim, of having climbed it as early as 1794, is hardly credible. 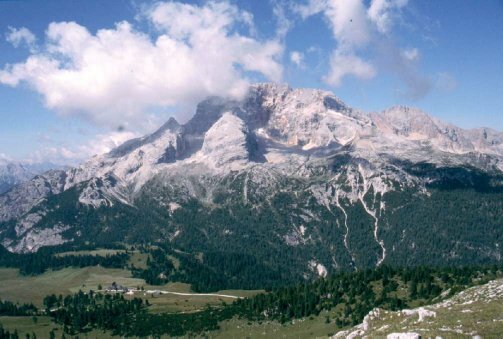 It mainly consists of Main Dolomite rocks, however partially covered by Jurassic limestones and Cretaceous marls, among which some reddish-coloured limestones that give the mountain the characteristic hue from which its name. In the Fanes' legend it represents the sacred mountain at whose feet Moltina, the kingdom foundress, grows up. It plays anyway no further role in the Fanes' saga as such, which is centered on the Cunturines. Climbs: several routes on all sides, from the 2nd., upper 2nd. and 3rd. grade up; the rock is often rotten; stone falls are frequent. The best support point is the Pia Helbig dall'Oglio unattended hut (CAI sez. Cortina) m 2253 in the vallon Montesela (South-West side). Excursions: interesting loop (10h) starting from Cimabanche m 1530: forc. Lerosa m 2020, 1.5 hs. (war remains); forc. Cocodain m 2332, 4 hs. ; Prato Piazza m 1991, 3 hs. 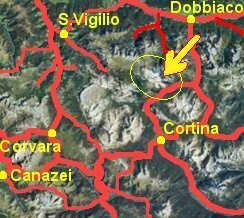 (war remains); back to Cimabanche through the valle dei Canopi, 1.5 hs. Shelter can be found, through modest detours, at the dall'Oglio unattended hut, Biella hut, Prato Piazza hut.